I am not usually a "follow the crowd" type of gal. Nor am I someone who likes to stand out too much. (I like to think that others might consider me to be a bit unique and quirky--maybe artsy--but not actually eccentric. My friends and family humor me in this regard.) However, I must admit that the blog fever about Clapotis is quite infectious. I mean, this project did not even make my planning list for 2005, which I only wrote a couple of weeks ago! 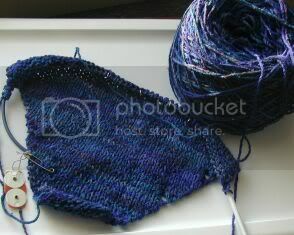 But after seeing various Clapotis in the works on other blogs, my fingers began to twitch. I found myself involuntarily surfing websites in search of good deals on Lorna's Laces Lion and Lamb (the yarn called for by the pattern) and for Noro Silk Garden (a popular substitution). Both yarns look incredibly yummy. Neither yarn fits in my current yarn budget. I teetered on the edge of temptation...and then I firmly sat myself down and reminded myself that I have about twelve projects on the needles, twenty-three-and-a-half more projects in the planning stages, and a large stash in the attic. No more projects, no more yarn. But wait...a large stash in the attic. Which is mostly worsted wools. Except for those few skeins that I got in a grab bag from Handpaint Heaven's January sale* a few years ago....yarns that I might not usually buy and which have been languishing, waiting for the right project to come along. The pictures makes the colors look a bit dark; I will have to take a better picture when I am further along. And while the yarn itself does not feel very soft, the knitted piece has a nice feel. I haven't reached the point where I will start to drop stitches yet, but I am enjoying the pattern so far; the knitting has a nice rhythm. The pattern is interesting enough that it keeps my attention, but simple enough that I can chat or watch a movie while I'm knitting. Now...if only I can avoid the call of Rogue. I love the look of the completed sweater, but I so rarely wear wool sweaters anymore. If I could find an alternative yarn that would work, then I might really be tempted. Most cottons would be too heavy, I think, and also not elastic enough to show off the cablework. I may have to give this some thought. *Handpaint Heaven has a fabulous New Year's Sale every year where they sell seconds, sample colorways, etc. I bought a "grab bag" for $25 that contained about $60 worth of yarn. It's a great way to use up that holiday gift money!